A Special Message for a Special Daddy, fully edible from Belgian Milk Chocolate. Hand crafted with your own words. 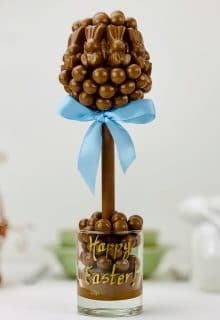 The Father’s Day Gift that can be entirely eaten, made by hand from Belgian Chocolate, then your message is scripted on with white Belgian chocolate. This Belgian chocolate Heart measures 7 x 8 inches, a giant heart for a special dad. What better way to celebrate a special Father on a special Day ! This Giant Heart comes gift wrapped in cellophane and has a protective box for easy delivery. Haribo® : Glucose Syrup, Sugar, Dextrose, Gelatine, Acid: Citric Acid, Flavouring, Fruit and Plant Concentrates: Safflower, Spirulina, Apple, Elderberry, Blackcurrant, Orange, Kiwi, Lemon, Mango, Passion Fruit, Aronia, Grape, Caramelised Sugar Syrup, Elderberry Extract, Glazing Agents: Beeswax, Carnauba Wax. Smarties: Sugar, Cocoa butter, Skimmed Milk powder, cocoa mass, lactose and protein from whey (from milk), wheat Powder, butterfat (from milk),rice starch, Emulsifier: Sunflower lecithin, fruit and vegetable concentrates (carnauba wax, bees wax), natural vanilla flavoring, invert sugar syrup. Bassetts Allsorts®: Sugar, Molasses, Glucose Syrup (contains Sulphites), Wheat Flour (with added Calcium, Iron, Niacin, Thiamin), Desiccated Coconut, Starch, Gelatine, Colours (Plain Caramel, Beetroot Red, Curcumin, Vegetable Carbon, Paprika Extract, Anthocyanins, Lutein), Fat-Reduced Cocoa Powder, Liquorice Extract, Flavourings, Vegetable Oils (Palm Kernel, Coconut, Sunflower), Caramel Sugar Syrup, Glazing Agent (Carnauba Wax), Concentrated Vegetable Extract (Spirulina). 8 x 7 inches approx weight 300grms.